Event tents are commonly thought to be high peak tents and canopies but it ranges to many other types of tents as well. An event tent can be a tent for a wedding, a comic convention, or a sports event at any high school. 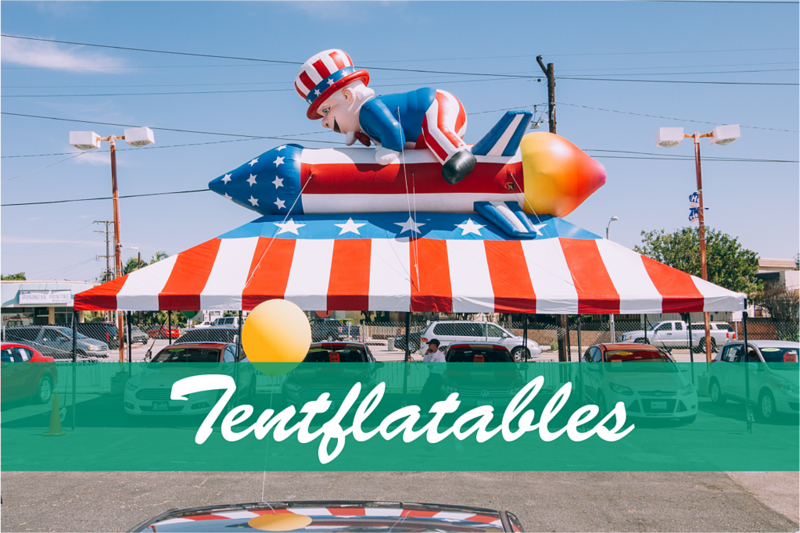 Everyone in southern California has seen a big red tent events or an under the tent special sale at local car dealerships. Local high schools host soccer, football, or baseball games and they take custom canopies with them with their team logo or mascot. Local fire, police and county departments also have a canopy with them at local events to set up their headquarters at nearby city activities. 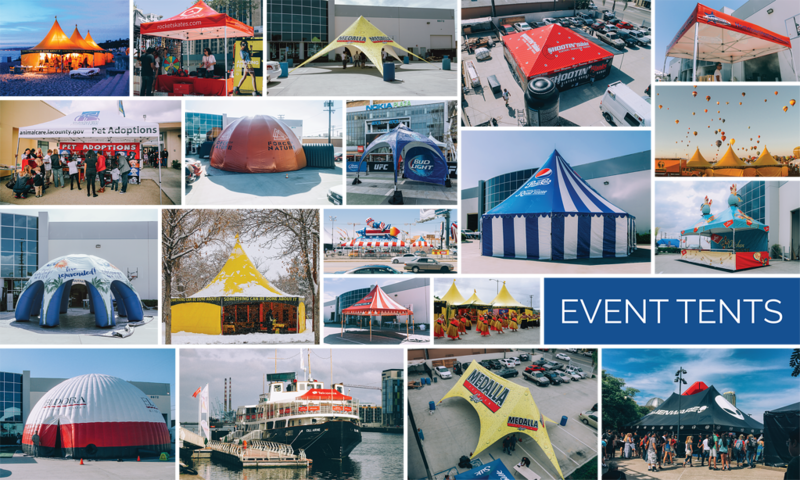 There are many other examples of event tents being used in other locations but first lets talk about the types of event tents. They range from small 5’x5’ tents to large tents that can be collapsed into small and easy to transport bags. We also have unique and special tents like the frame dome tent, star tent, or the parasol canopy. These specialized tents can be further customized with printing and accessories. We also manufacture the standard frame tent, the double tube tent, and high peak tents as well. Every one of our tents is made with an extra strong tarp that can hold the entire tent together without ripping but still offering a heavy duty quality. Our smaller tents are made with the exact same vinyl as the large tent but on the smaller ones we can substitute the vinyl for a polyester with nearly the same properties as the vinyl except it is not quite as strong. The star tent is an incredible tent with a beautiful design. The can have a single peak or they can have two different peaks that will keep the structure together. These beautiful tents are definitely different in that they do not look the same as all other tents but it truly makes them unique. As with all of our product we make it as easy and safe as possible to operate any of the products we manufacture. This tent takes no more than 20 minutes to install and when it is compacted it fits in a bag that doesn’t take up too much space. These look great with a lot of printing because they are elegant in design, but when you add printing it puts them on a whole new aesthetic level. 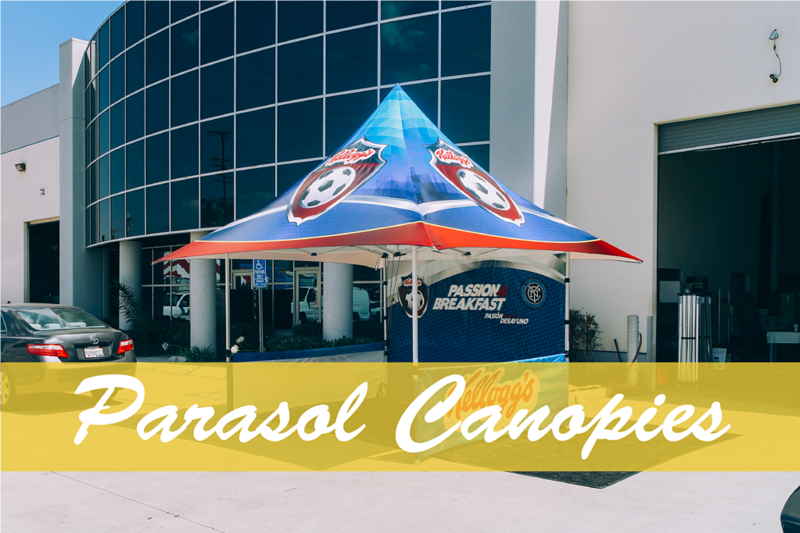 Parasol Tents have one of the sleekest designs among all canopies. These canopies provide a little bit of extra space from each section and there are no valances, which are the rectangular sections on every side of the tent. This is a very beautiful tent that opens very wide and since no one else makes anything similar it stands out when it is seen with other canopies. It has more of a brim on the edges, like that of a hat, instead of valances which hug the frame they are attached to. This special canopy can also be printed with as much graphics as necessary so that you can take your imagery with you everywhere. This canopy takes almost the same amount of time as any other canopy which is about 3-5 minutes or even less. On top of that you can transport the entire tent with you without having to have too much muscle power because it is rather light. 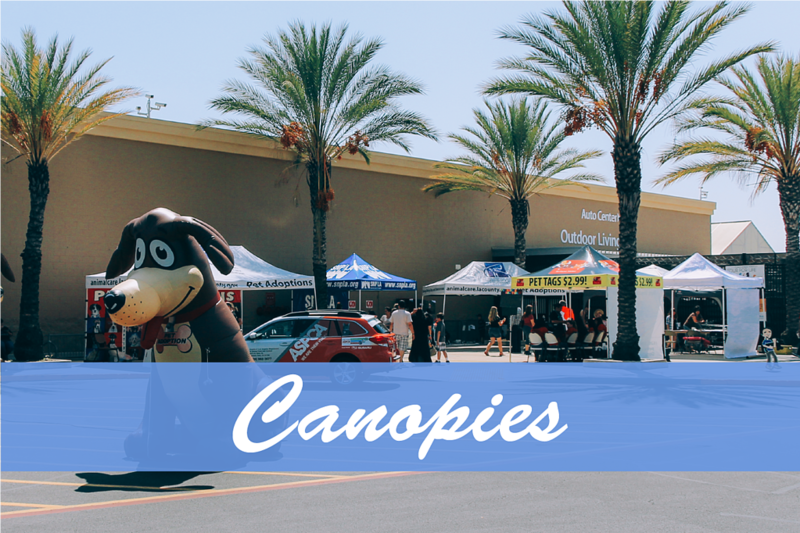 A canopy is one of the best ways to go about your marketing strategies because you can take it anywhere and you can have your entire setup ready in a matter of minutes. Since it is our most popular product we have refined the custom canopy to the point where it is the best canopy anybody can ever purchase. The frame is the best combination of weight and strength that any canopy has come to have and the tent top is the best material that is possible to have on any tent top. Overall the whole package is portable and it is super easy to install. The tent top is waterproof and fire-retardant and its design is sleek. 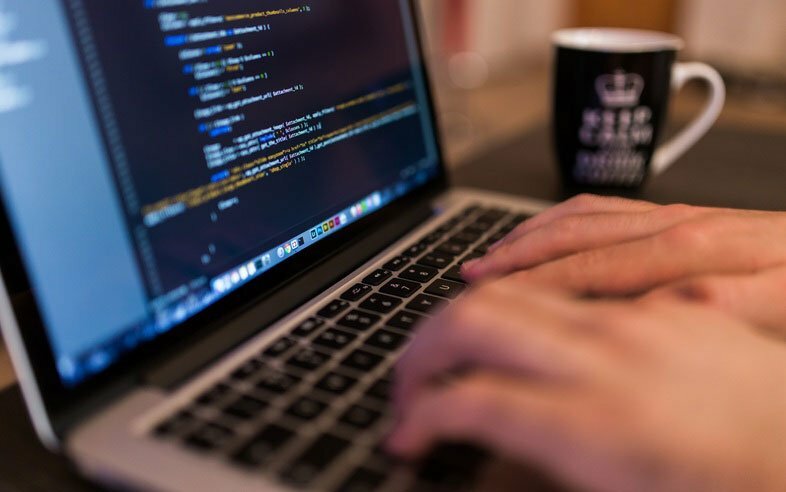 It is also the best way to get the best bang for your buck because we have pre-planned packages that make it easy to select what you need while giving you a bit of a discount. Pop up canopoies are the most common tents for events anywhere possible becuase of their easy handling. There are simpler tents that are a little older in their design but they are definitely tried and true. Every tent manufacturer has had very similar designs in standard frame tents but what helps us stand apart is the fact that we have come to perfect the formula for manufacturing tents. 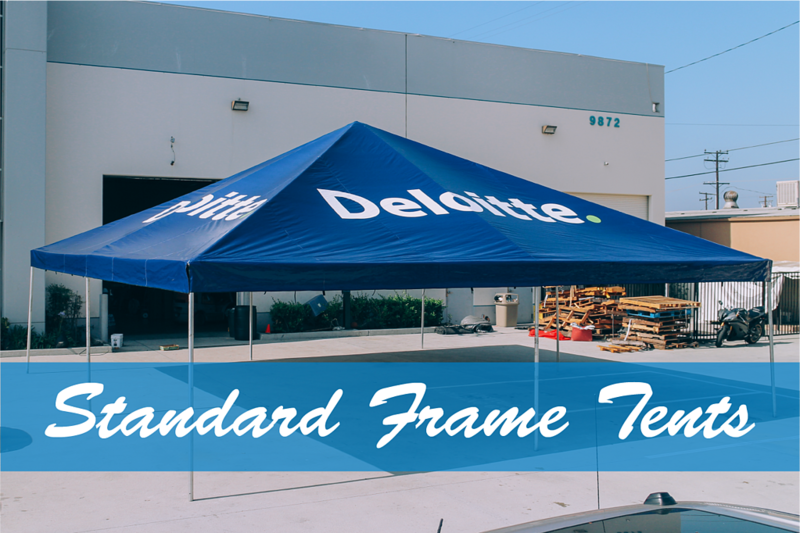 Although many look exactly the same our standard frame tent is a piece of art with precision cutting and fabrication. Every little detail in the tent has a function and we’ve come to see the bigger picture. The standard frame tent is the classic tent from which modern tents derive their designs from and we are happy to constantly take ideas from it and redesign it into a bigger and better tent. 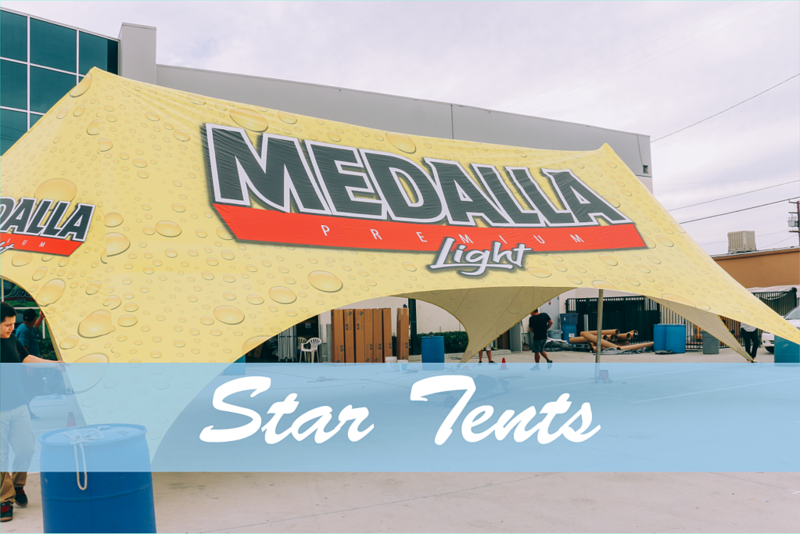 These tents can be extremely large and their installation is not the easiest ever but it is worth waiting for because when these structures are finalized you realize that they are mobile buildings. High peak tents have, as the name implies, a high peak. This is more of a pointed peak than that of other tents and canopies because the slope of the peak is higher than the typical tens that range from a 25-30 degree slope. It is also a unique tent because we can take the same construction and DNA from this tent to make bigger high peak tents with multiple peaks. As with every one of our custom tents we can print anything you want on its surface and it will coated to ensure the print does not fade or get damaged by the elements. This coating also defends the print against U.V. rays that damage any kind of print that is not digitally printed. 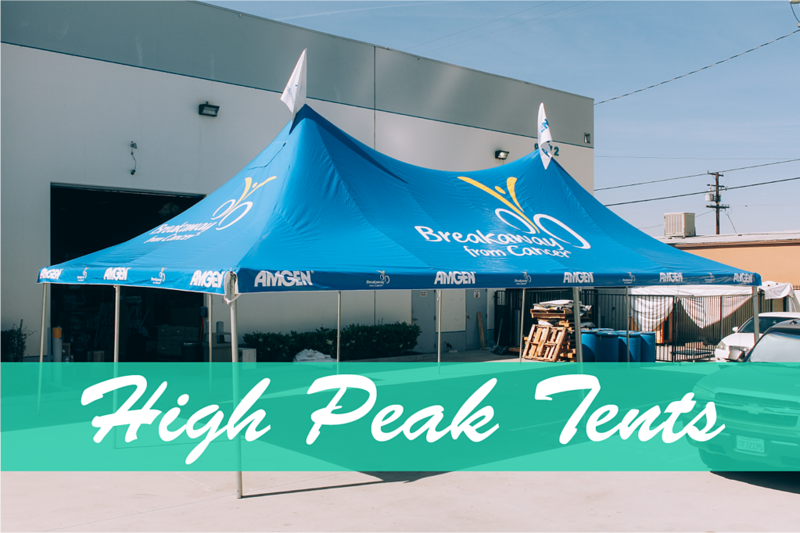 High peak tents are some of the best party tents out there because they are roomy and hosting large events is an easy thing. 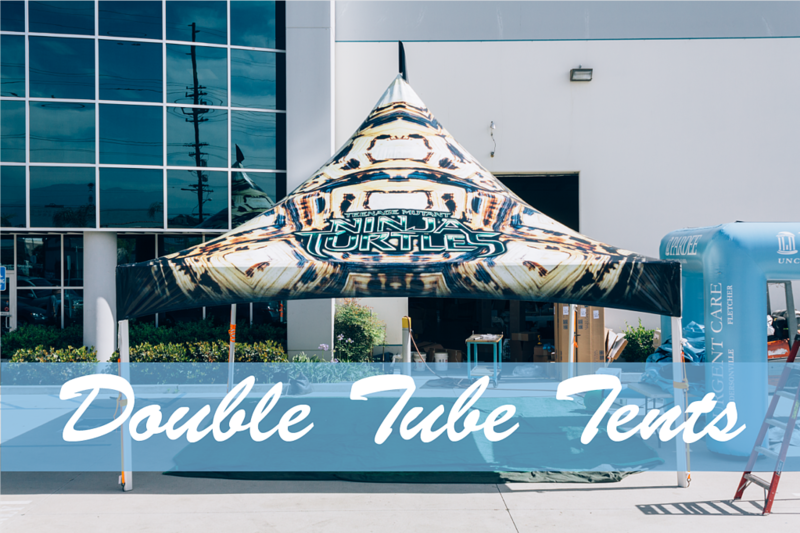 Double tube tents are incredibly strong tents that can take on the same design as many other tents but without as many tubes holding the structure together. The typical 20x20 tent has eight legs that hold a tent together but a double tube 20x20 tent only needs 4 legs. This give the user more room to walk through and it clears up space for larger furniture or tables or even cars to go through. 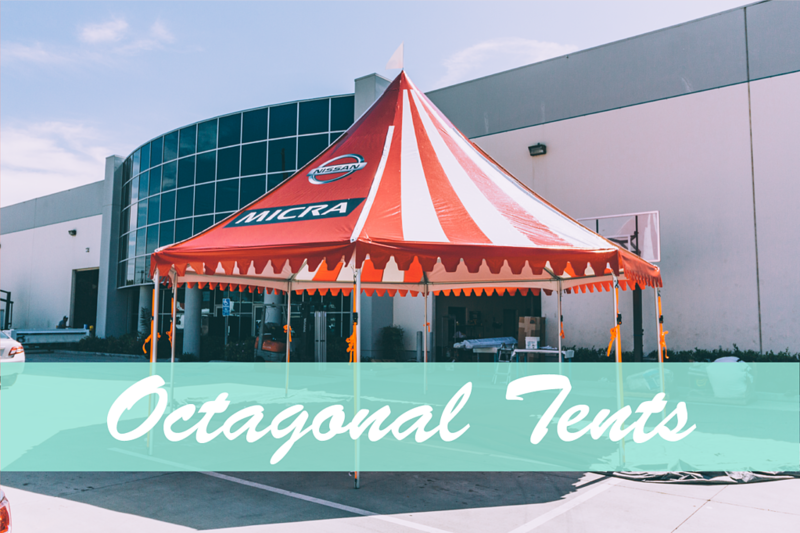 Many car dealerships showcase their top of the line vehicles under a tent but they make sure to get a double tube tent to have the space to drive an entire vehicle through it. 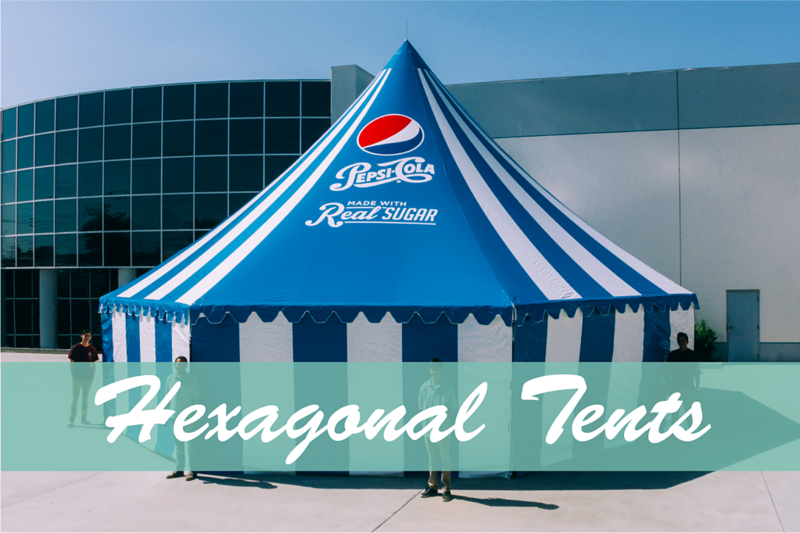 Hexagonal Tents are high peak tents with higher structural integrity than that of a 4-sided tent. The four sided tents usually form a pyramid shape on top of the tent but with more connectors and pole brackets the hexagonal tent is definitely a stronger build. We have developed a great deal of many of these tents to the point where we have perfected them and making one is an easy process for us now. We also manufacture octagonal tents which is what we have come to know as carnival tents because they are more commonly used for carnival events. The most generic shape is a square but we are not limited to just a square because we love to experiment and create new tents and in search of a strong structural integrity we developed the hexagonal tent. Frame tents are usually square but we have developed not only a hexagonal tent but an octagonal tent as well. These tents form a high peak frame tent when it is completely assembled but the amount of space inside them is more ample. These tents can also be combined with other octagonal tents to form a sort of interconnected system of housing. They are definitely different than other tents because of how much bigger they are and because of the different shape it comes in. We developed it during a custom tent project while developing some of the first festival tents. Frame dome tents have a unique shape and design that no other tent has at all. This tent is a half-dome built with a sturdy frame that will hold its shape and sturdiness because the structures are so well built and designed. The dome tent allows you to have graphics with a lower base for your graphics so people can see it up close. Attaching the tent top is rather easy because the entire tent top is a single piece with designated sections that help you know where to attach each section. 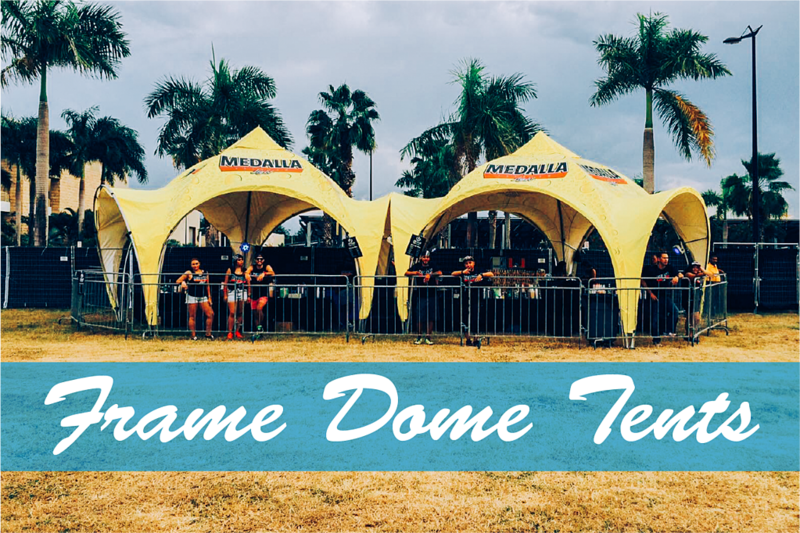 Custom dome tents can also be designed to be taller rather than having the base of the graphics on the floor like the tent above. Along the years we have seen a great deal of tents and we have contributed to many designs, but developing a tentflatable (a tent with an inflatable on top of the canopy cover) is not an easy process. We use advanced CAD software that allows us to develop some of the most complex custom inflatables in the world and we have applied the same development techniques to manufacturing a tent. At the same time we have gone ahead and combined these all together in the creation of the tentflatable.We have now deployed a couple of hundred of these tents everywhere we can and we have seen an increase in people's interest, especially in the automotive industry, but it is not limited to that, since we have also developed other designs and applied it to other types of tents as well. On a hot day where sweat rolls down your face all everyone around you is thinking is about cooling off. Sometimes shade is just not enough to cool off, although staying in direct sunlight can cause the exposure to it to feel 10-15 degrees hotter. We know hot weather first hand and it is not that great so we have made something so we can cope with harsh heat. 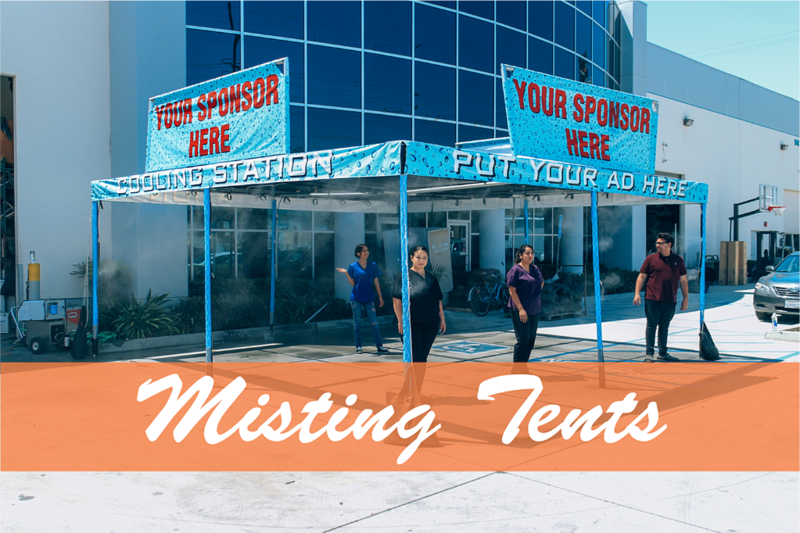 This is a misting tent and they provide relief to anyone standing in the sun all day because they have little jets that spew a soft breeze that feels great in any sunny day. These tents are very easy to install and they can be manufactured in nearly any size needed. They can also have printing and you can have custom signage added to nearly any surface on it that you need. Festivals use these to keep people cool with the misty water they spray everywhere. They are also heavy duty and sturdy so regardless of what situation they are in they will keep their shape and form without hurting anybody. Inflatable tents are incredibly ingenious tents because they are super easy to setup. You place it on a tarp and then you connect it to a power source and voila. All you have to do then is secure it but that is only a matter of minutes. The are also great because they can range in shape and size. The can be domes, large rectangular prisms, or really large tunnels. These can also be custom printed and they can be made in really large sizes when you are expecting large crowds. You can host a party, a gala, or any other kind of event in these because of how awesome they are. Tents are not limited to aluminum frames as mentioned before with inflatable tents. Inflatable tents are very complex tents that we design with incredibly advanced 3D modeling software. We calculate airflows and map every pattern and then we manufacture everything with great detail. When the entire product is finished the craftsmanship stands out as opposed to Chinese manufactured inflatables. 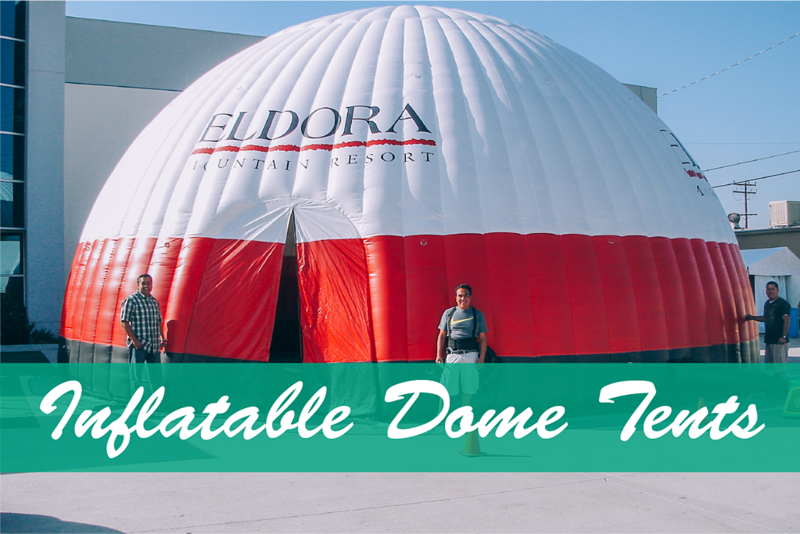 We have created 50 foot wide inflatable dome tents with removeable tunnels on each end and custom printing on the entire unit. We have also made smaller interconnectable units that at 15-20 feet in diameter with other units connecting via the removable tunnels. 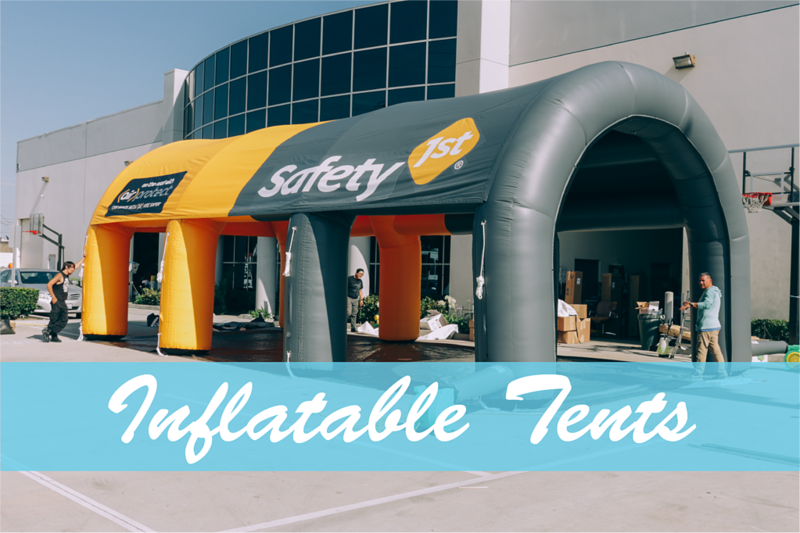 These large inflatable tents are very complex, but setting them up is an easy matter that only takes 10 minutes to install.